A Chuchville, Pa. native, Steve Lichtner came to the University of Miami after a high school swimming career that saw him earn All-American recognition four straight years. He was recruited by Miami head swimming coach and UM Hall of Fame inductee, Bill Diaz. Lichtner had an outstanding career at Miami that was highlighted by his earning All-American recognition in each of his four years. 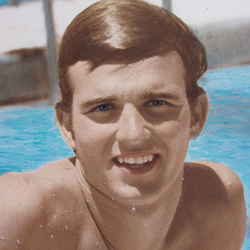 In 1975, Lichtner etched a mark in Hurricane swimming by becoming the highest finisher in a freestyle event, ever. He finished 4th in the 100 freestyle, something no other UM swimmer had ever accomplished. Lichtner also earned All-American status in the 40 freestyle relay, 1973, 1974 and 1975, and the 400 medley relay, 1974, 1975 and 1976. While at Miami Steve led the Hurricanes to national finishes of 12th in 1973 and three consecutive 9th place finishes in 1974, 1975 and 1976. In 1975 he was selected to the United State entry to the Pan Am Games, but declined the invitation to concentrate on his on his degree. During his senior year he was selected as a member of the USA National team and he also qualified for the US Olympic trials.